The primary source of our funds was our annual Catfish Derby. Thanks to the able leadership of Catfish Derby Chair, Gail Jonas, the multitude of hard-working volunteers, and the generosity of sponsors and donors, the Derby was a resounding success; providing excitement and family fun for catfish anglers, bringing in considerable extra commerce to our community, and netting over $14,000 for our community charity funds. 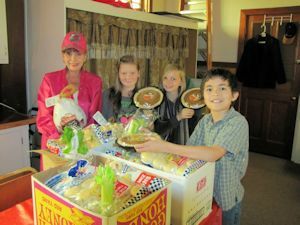 East Lake Students and member Doreen PostenWith CLOGBA funds, Red and White Market sponsorship, help from some CLOGBA members and students from East Lake School, we distributed 20 Christmas meal boxes to needy families in our area. Our Maxine Sherman Memorial Annual Fireworks once again delighted crowds on the lake and on the shore. Thank you, Bill Stone for chairing that project and thank you A&B Collision and Red and White Market for contributing as sponsors. Thanks to everyone for working together to accomplish all that we did last year.